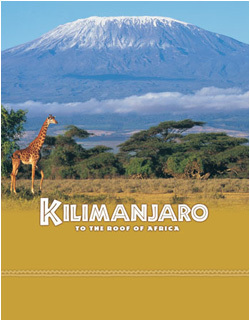 Tagline: "Five climates, six climbers, 19,340 feet of mountain"
Since I was a kid, I’ve wanted to visit the Serengeti, which, for some reason, always struck me as one of the most beautiful places on earth. And if the opening shot of this 2002 documentary is any indication, I'd say I was right; in it, a giraffe makes its way across a great expanse of the African plain, the setting sun casting an orange glow that illuminates the entire area. But this isn’t a movie about the Serengeti, or Africa’s vast collection of wildlife. This film focuses on a much different, yet equally awe-inspiring locale: Tanzania’s Mt. Kilimanjaro, the continent’s largest mountain. With Jacob Kyungia (who has climbed Kilimanjaro some 200 times) as their guide, five people: Scientist Roger Billham, Author Audrey Salkeld, Danish model / adventurer Heidi Albertsen, and two kids, African Hansi Mmari and 12-year-old American Nicole Wineland-Thomson (accompanied by her father, who remains off-screen), attempt to climb Mt. Kilimanjaro, hoping to get an up-close look at the fabled snows that line its peak (having lived in Tanzania his entire life, young Hansi has never experienced snow). Of course, the group has a long way to go before they reach the top, and must first make their way through a rainforest, across a desert, and over the mountain’s arctic region before arriving at their ultimate destination (“It’s like walking from the equator to the North Pole in only a week” says Jacob in voice-over). Despite such hardships, all are determined to see the trip through to the end, but will the rough terrain and cold, thin air eventually get the better of them? Featuring interviews with each of the five climbers, and with Jacob providing narration, Kilimanjaro: To the Roof of Africa offers some amazing insight into the mountain, as well as its surrounding region, which, at times, is every bit as harsh as Kilimanjaro (in the desert that lines the base of the mountain, temperatures rise during the day, then drop to freezing at night, forcing the local flora to adapt to both extremes). While there’s little to no animal life on the mountain, the explorers do, at one point, stumble upon the skeletal remains of an elephant, leaving them all to wonder why it climbed 15,000 feet just to die. Yet the majority of the film is dedicated to the trip itself, with each participant giving brief updates on how they’re handling the ever-changing conditions. Because of this, Kilimanjaro: To the Roof of Africa isn’t what I would call an adventure movie (the filmmakers do try to generate some drama during the interviews, when a few climbers say they don’t know if they’ll make it to the top, though, to be honest, their doubts aren’t explored in any great detail). Yet while it may lack the “thrill-a-minute” excitement of other IMAX films, it is, in the end, a satisfying journey of discovery, which, punctuated by the fabulous score of composer Alan Williams, makes Kilimanjaro: To the Roof of Africa a movie that's well worth your time.